Would you like to give visitors the “wow” factor that makes your page stand out from the crowd? Media stats company socialbakers.com say that custom branded pages grow on average 44% faster than basic pages. Maximise your “likes” and sales from the start with one of our powerful, interactive custom Facebook pages or tabs. Hard to imagine how it’ll all look? 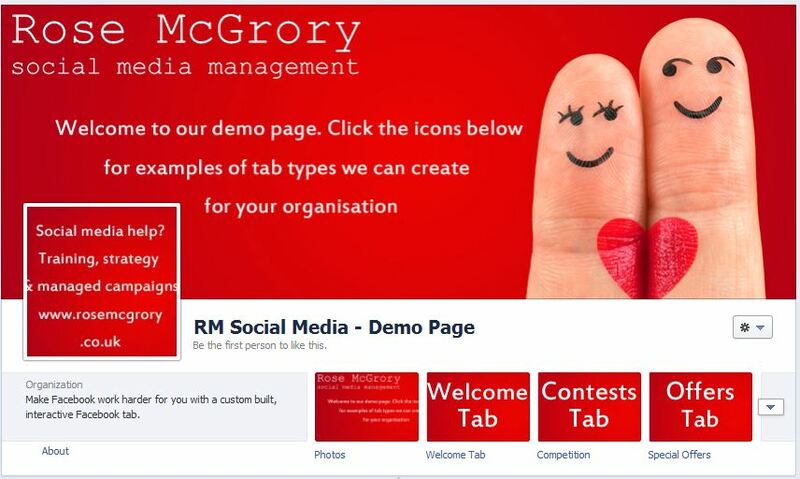 Well, we’ve created a demo page within Facebook so that you can have a play with many of the functions on offer. Just click the thumbnail below to be taken to the live page. PLEASE NOTE, if you don’t click “Like” on the demo page, you won’t be able to see all the functions – for example, the photo contest is designed to ensure that visitors “Like” the page before they can enter. Full management and hosting of your custom page is included in the cost, so if you need to change a special offer, or link up to a new menu, we’ll take care of it for you – you need never touch any code. Ready to have a chat about upgrading your Facebook presence? Get in touch.